GANGEL: So what do you think about presumptive Republican nominee Donald Trump? GANGEL: It has to unite around him? QUAYLE: It has to unite around him. They will. There will be a few holdouts that are always holdout. And you all will point out those holdouts. They’ll get a lot of air time in CNN and other networks. But by and large, I think the party will rally around him. But we need to step back. I mean a year ago, uh — and I put myself in this camp. Nobody thought that Donald Trump would be the nominee of the Republican Party — or very few people, let me say. GANGEL: What did you think was going to happen? QUAYLE: In the normal sorting out process, the cream usually goes to the top, right? And I didn’t realize that Donald Trump was going to be the cream that got to the top. I totally misjudged his ability to win. But for somebody that has really no experience in politics to be able to start off and to win with a strong field and not even go to the convention, that he is the presumptive nominee a month before we have our final primaries is quite remarkable. It shows that he is a winner. He knows how to win. GANGEL: You will support him, you will vote for him, no reservations? GANGEL: Do you know something? QUAYLE: No, I will say this, Paul Ryan, in my view, will end up — will support our nominee. There’s — there’s very little doubt in my mind, for a couple of reasons. One, you know, he’s a team player. He’s got a big team in the House of Representatives. The second reason is, is that most of this caucus, I’d say probably 85, 90 percent of his caucus is going to support Donald Trump. GANGEL: President Bush 41, President Bush 43, have declined to support Trump. Mitt Romney called him a phony and a fraud. Ted Cruz called him a pathological liar. Should all of these people come around? QUAYLE: I — I’m sure that there will be some that will sit it out, maybe some that might even vote for Hillary Clinton. I hope those that have said they won’t support him now will reconsider and before they cast their vote on Election Day in November, would end up voting for him. If not, don’t show up. GANGEL: You think Donald Trump can win? 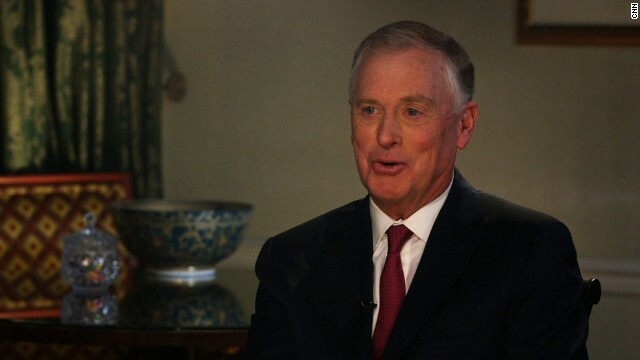 QUAYLE: I do think he can win. I think he can win because this is clearly the year of the anti-establishment, if you will. So if you want more of the same, Republicans or Democrats, more of the political mess in Washington, I mean you’ve got the quintessential establishment candidate in Hillary Clinton. GANGEL: One of the big concerns about Donald Trump is that he does not have the temperament, the character to be president. Lindsey Graham said he wouldn’t trust him with nuclear weapons. Do you have any of those concerns? QUAYLE: Donald Trump has just won the Republican nomination, at least he’s the presumptive nominee. And he won in a very competitive race. He’s a winner. He knows how to win. Now, he’s got to run a general election and he, I’m sure, is going to — as he said, I’m going to change my demeanor, I’m going to change my strategy, I’m going to change my approach. So people will start to look at him differently. And they’ll be making the judgment whether he has the temperament, whether he has the gravitas, whether he has the ability to be in the Oval Office and make those decisions. Because I’m sure that he knows this. Winning the nomination is one thing. Winning the general election is another thing. GANGEL: But you think he can do it. QUAYLE: I think he can do it and I think that he needs to show the American people that he’s capable of doing it. And I think you’re going to see a little bit different campaign in the general election than you saw in the primary. GANGEL: So we’ve heard all the outrageous things he said, all the offensive things he said. You think he’s going to pivot now from that? QUAYLE: I think that people are going to judge him going forward and that’s what it’s going to be. They’ll listen to what he has to say at the convention very carefully. He’ll be making some substantive speeches on foreign policy, economics, bringing people together. There will be debates. How about that debate between the two presumptive nominees? Or I guess she’s not presumptive yet, but if, in fact, it comes down to Donald Trump and Hillary Clinton, that’s going to be bigger than the Super Bowl. So stay tuned. It’s going to be a wild year.